A revolutionary technology to prevent biofilm formation, slime and reduce bacteria contamination in condensate drainage systems Used for refrigeratION SYSTEMS in EU supermarkets. Supermarket refrigeration display cabinets globally suffer from a build of bacteria known as Pseudomonas. This type of bacteria is known for its self-produced mucus that latch onto the internal surfaces of the waste water drainage pipes where they continue to grow and generate larger forms of biofilms and slime eventually resulting into the clogged drain pipe. Over a period of time the buildup is so severe that it causes a full blockage of the drainage pipe which results in water leaks, maintenance issues, service call-outs and possible outbreaks of pathogens. On average a typical supermarket can have up to 20 service call-outs for blocked drains and water leaks over a period of 6 months. Each call-out can mean there is water on the floor of the supermarket with the possible threat of customers slipping and getting injured. It can mean the chiller or freezer needs to be switch-off and cleaned out, storing the products elsewhere. And it usually leads to a significant amount of time and chemicals used to clean the drainage system to get rid of the blockage and biofilm buildup, which is not always successful leading to a full dismantling of the drainage system. It is clear that supermarkets encounter significant costs on these occasions not mentioning the disruption for the staff and the customers in the store. And adequate action is required immediately to prevent hazardous circumstances to occur. With a strong corporate-wide focus on being more sustainable, poring harsh chemicals down the drain on each occasion is no longer a preferred solution. UK based Bio Products Group recognized the issues with freezer and refrigerator drainage systems encountered by EU supermarkets and teamed up with antimicrobial plastic developer Parx Plastics from the Netherlands. Integrating their innovative solutions in the Bio Pipe® and Bio Pad products created a sustainable anti-clogging solution that can reduce call-outs by up to 100% over a period of time, saving supermarkets chains a lot of costs and disruption involved with blocked drains. 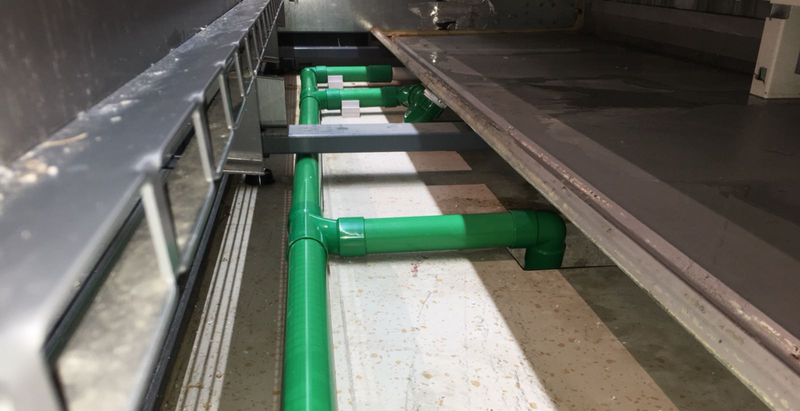 New installation of Bio Pipe drainage pipe with innovative technologies for a refrigerator set at a UK supermarket. Bio Products Group fitted the first supermarkets in the UK with Bio Pipe parts and pipes in October 2016, closely monitoring and measuring the progress over a period of 12 months. Swab samples were taken at 3-month intervals in different phases of the draining system to monitor the bacteria and biofilm development. Swab data bacteria colony count after 3 months. Scientific laboratory tests show an increase in bacteria count down the length of the drainage system while the Bio Pipe systems proves to have a continuous decreasing bacteria count down the length of the drainage system. In the standard pipe system, the Pseudomonas bacteria colony count increase during the length of the system and blockages were found in the standard system at the time of testing. Moreover, the internal wall area of the standard pipes is visibly soiled with dirt and slime. In contrast to the pipe with the integrated technologies from Parx Plastics. These systems showed a significant continuous decrease in bacteria count during the length of the system measuring as low as less than 20 colony forming units of Pseudomonas in the little present, loose laying, slime. The internal wall of the Bio Pipe drains appears clean, smooth and without any slime latched to the walls. Internal wall of the Bio Pipe® (left) 12 months after installation vs the internal wall of a standard pipe (right) 6 months after a deep clean. “With the application of the Parx technologies in these drainage pipes Bio Products Groep has found a highly interesting application for our technology.” says Michael van der Jagt, CEO of Parx Plastics NV. “With its well-founded research of over the last 24 months it was proven that the technology does not only have a highly effective (broad spectrum) antimicrobial functionality, but it also acts significantly against the formation of biofilm.” “This was new information for us and is greatly contributing to the long lasting effects and benefits of the technology in specific applications.” highlights Van der Jagt. Bio Products Group is a UK based solution-oriented innovator focusing on adding value and offering sustainable solutions. The first products of the company are related to the supermarket channel resolving hygiene and clogging inconveniences with refrigeration systems found through out all EU supermarket chains. Parx Plastics N.V. is a Netherlands and Italy based biochemistry developer in plastics and polymers with its shares listed and traded on Euronext Paris with ticker MLPRX and ISIN code NL0012650535. Parx has developed a biocompatible technology making plastics antimicrobial by making use of a bodies own trace element. The technology creates a surface that is preventing biofilm formation with an effective Log3 and higher antimicrobial performance without the migration of any substance.